St Josaphat Kuntsevych, né John, was martyred in the year 1623 for his ardent championship of union with Rome among the Byzantine Rite Christians of the Polish-Lithuanian Commonwealth. A member of the Basilian Order, he was made bishop of Vitebsk in 1617, at the age of only 37, and archbishop of Polotsk the following year. (Both cities are now in Belarus.) In a period of great tension between Catholics and Orthodox, he went to preach at Vitebsk; on the steps of his co-cathedral he was struck in the head with an ax, and then shot by fanatical opponents of the union with Rome, on the sixth anniversary of his episcopal consecration. They then tore off his clothes, and for a moment thought they had killed the wrong man, since he was wearing a hairshirt underneath; the body was thrown into the river, but recovered three days later. The Roman Breviary states that the first beneficiaries of his martyrdom were his own assassins, who were all reconciled to Rome, as was his principal opponent among the Orthodox clergy, Bishop Meleti Smotrytsky. Beatified only 20 years after his death, he was canonized by Blessed Pope Pius IX in 1867; originally assigned to November 14th, his feast was moved to the day of his death in the Calendar revision of 1969. 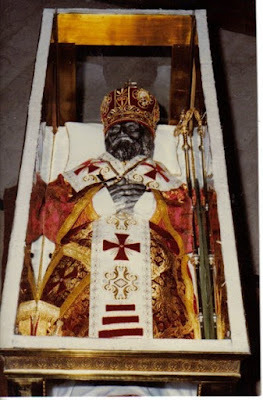 The relics of St Josaphat have a remarkable history. At the time of his beatification, they were enshrined in a silver casket at the behest of the Prince Leo Casimir Sapieha. In 1706, they were brought to the castle of Prince Karol Radzwill in the city of Bila Pidlaska, and then moved to the Basilian church in the same city. In 1873, during Tsarist persecution of the Greek-Catholic Church, the relics were removed from the altar of the church to the crypt, hidden in a wall, and apparently forgotten. However, when Bila Pidlaska was occupied by the German army in 1916, a priest of the Basilian order, Fr Pavlo Demchuk, was sent by Fr Platonid Filas, the General Superior of the Basilians, to recover them. Their location in the wall of the crypt was revealed to him by a man who had seen them being immured more than four decades earlier. Fr Demchuk transferred them to Vienna, where they were kept at the Ukrainian Catholic Church of St Barbara. 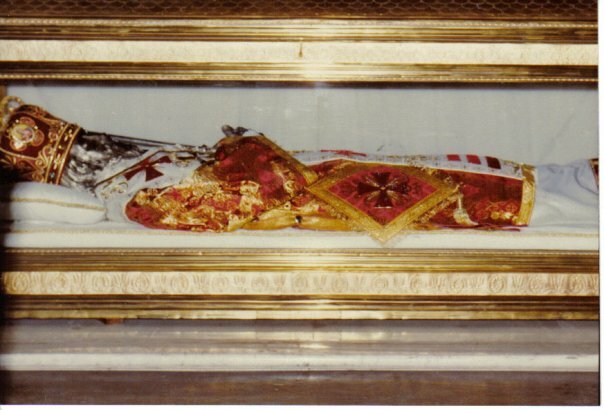 At the end of World War II, on the eve of the Soviet occupation of Vienna, the relics were moved again, smuggled away to Rome for safekeeping. Originally, the Basilians had planned to enshrine them in their monastery on the Aventine Hill; the street from which the church is entered was even renamed “Via San Giosafat” in his honor, and retains the name to this day. However, Pope Paul VI decreed that this “outstanding champion of Catholic communion should not be separated from blessed Peter, to whose See he remained unshakably faithful, nor from his father, lawgiver and master in the monastic life of the East. (St Basil)” The relics were therefore exposed for the veneration of the faithful in the altar of St Basil in St Peter’s Basilica. The relics of St. Josaphat in the altar of St. Basil, after their re-vesting. In 1982, the reliquary was re-opened and cleaned, and the relics revested. The hands and face of St Josaphat were covered by bronze masks donated by the Basilian Fathers of Canada, new vestments were donated by the Sisters Servants of Mary Immaculate, and a Byzantine mitre was donated by the late Archbishop Myroslav Marusyn, Secretary of the Congregation of the Oriental Churches from 1982 to 2001. The late Father Raphael Melnyk, Provincial Superior of the Canadian Basilians, testified that the body was intact and the limbs could still be lifted, despite the fact that the Saint had lain at the bottom of the river for three days in 1623, and had been in a humid crypt in Bila for 43 years. My thanks to the Rev. Dr. Athanasius McVay, a priest of the Ukrainian Eparchy of Edmonton, for the information on the history of St Josaphat’s relics, the photograph of the icon, and the two photographs of the relics taken during the re-vesting in 1982. The reliquary of St. Josaphat opened during the process of cleaning and re-vesting in 1982.